With de-icing already underway in some cities, the airline anticipates hundreds of fewer cancels due to winter weather. Delta continues to invest year-round in the airline’s de-icing program, spending millions in 2018 on enhancements including the launch of an advanced de-ice real-time tracking and throughput monitoring dashboard, an innovative weather data monitoring system utilized by the airline’s 24/7 in-house Meteorology team, and upgrades to training, equipment and fluid inventory. 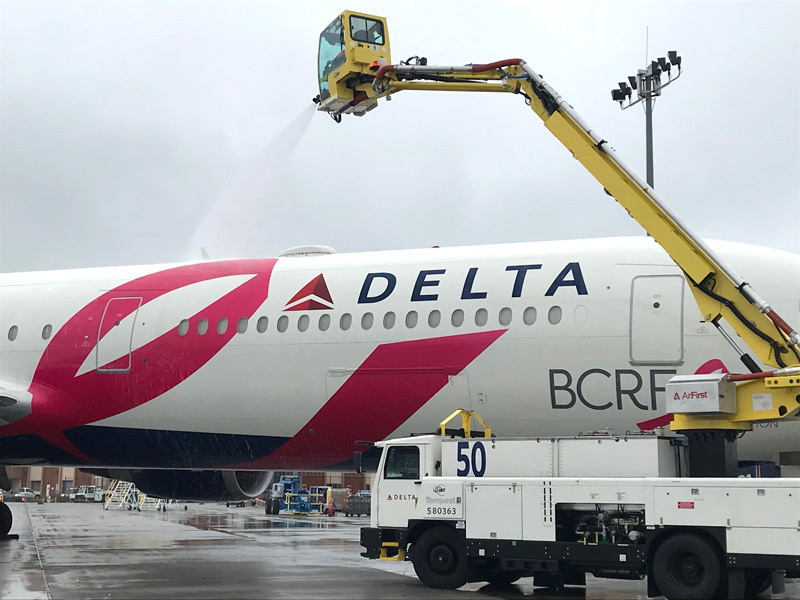 Improvements in de-ice pad management in key cities and 20 new trucks in Atlanta, the airline’s largest hub, further enhance Delta’s overall capabilities. 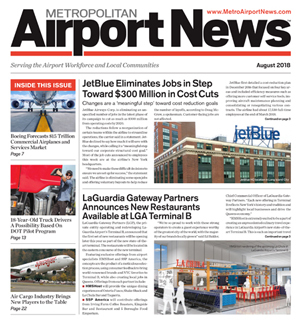 The airline’s on-time operation will also benefit in eight further cities from the addition of Type-IV glycol fluid, which when applied on critical surfaces like the wings and tail after the de-icing process, prevents ice from reforming on the aircraft before takeoff — this enhancement alone would have allowed for 143 fewer cancels in 2018. De-icing is vital to an aircraft’s safety of flight and, at Delta this winter, coordinated teams of trained professionals will be safely clearing queues of departing aircraft on designated pads more efficiently than ever before. Each part of the de-ice process has been meticulously analyzed and optimized to elevate the safety and reliability Delta customers count on. The planning and preparation continues year-round for the heavy de-ice season, which begins in the fall and continues through spring, in support of the airline’s goal to increase throughput, or the rate at which planes can be treated for frozen precipitation contaminants. Boosting the targeted throughput in a busy hub, in turn, benefits the airline’s flow of downline flights and eliminates potential cancels caused by constraints related to inclement weather. In an effort to make de-icing seamless system-wide, employees from Delta’s snowiest hubs in Minneapolis and Detroit came together with leaders from Atlanta, Boston, Cincinnati, New York, Salt Lake City and Seattle, as well as the operational performance and analysis team over the past year to share best practices and opportunities for company-wide process improvement. The team, comprised of employees from Airport Customer Service, Flight Operations, Ground Service Equipment, In-Flight Service, Operations Analysis and Performance, Delta Connection, and the Operations and Customer Center (OCC), lent their expertise with one goal in mind: keep the operation moving safely when winter weather strikes. And, because no airport is identical, they optimized processes and resources system-wide and down to the station level. De-icing can be a complicated task and Delta people work year-round to master the art of the spraying aircraft. Following annual classroom and computer-based training, on-the-job practice lets employees perform a live run through of the de-ice process using trucks to spray water on parked aircraft, offering a live test at clearing an aircraft of contaminants without the pressure of a fast-paced de-ice storm response. 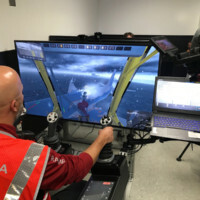 New this year are two state-of-the-art simulators that give employees in Atlanta the opportunity to get on-the-pad experience right from the classroom. 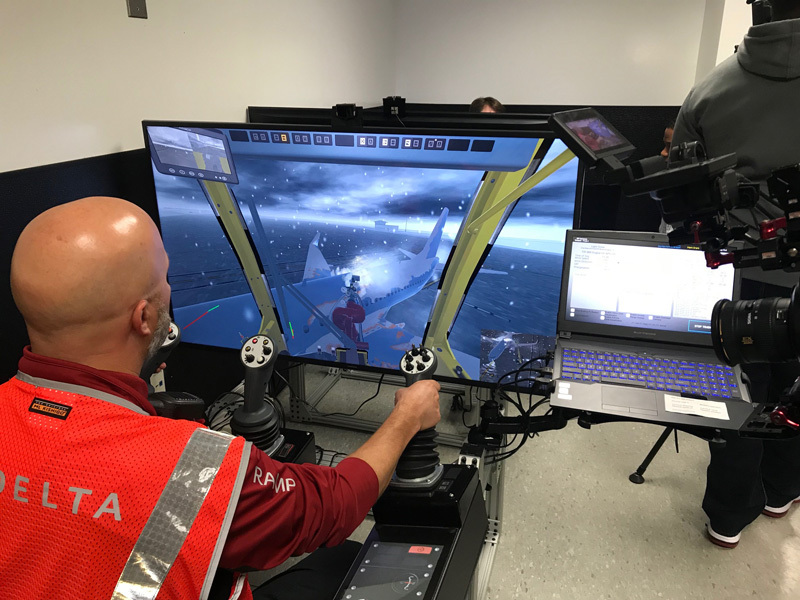 The simulators are designed to match a de-ice truck cab and allow employees to practice their skills safely and without adding extra wear to equipment. The newest tool to support the airline’s de-ice throughput goals is Delta’s innovative, proprietary De-Ice Manager and mobile app. 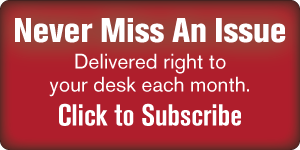 The system is designed to provide real-time updates to de-ice crews on the ground via handheld devices and to teams in the ramp control tower and OCC through a dashboard. Additionally, the De-Ice IT manager system captures the real-time data for better coordination and quicker recovery and has been deployed to Delta’s northern hubs, where winter conditions have already begun. Before this season, data on the de-ice process was captured by hand and with the new platform, teams will now have immediate visibility to the de-ice process and accurate throughput data at the airport and pad level, as well as surface tracking and fluid inventory monitoring. When needed in previous de-ice events, a Go Team was assembled and dispatched to provide assistance at impacted airports, contributing to a 10 percent decrease in spray times. This winter, ACS teams will begin mobilizing the Go Team proactively to key cities as winter weather is anticipated. Sourcing volunteer candidates to travel on demand has been standardized, notifying employees via push alerts and ultimately reducing what was previously a 24 hour cold call process down to just one hour. This group, comprised of approximately 124 employees across the system, will be deployed up to 48 hours before a forecasted storm to provide on the ground support. The streamlined mobilization of a pre-positioned Go Team and temporary-duty assigned employees accompanies the airline’s focus on proactive action, with improved hotel room blocking and Lyft rideshare vouchers for employees travelling to and from work in cities with forecasted winter weather. Safety and reliability remains top of mind as the airline projects another record-breaking holiday season for 2018. Ahead of any forecast storms, Delta’s OCC team coordinates proactive measures to mitigate operational impacts including travel waivers that provide customers flexibility in their travel plans if traveling to, through or from an airport affected by weather. 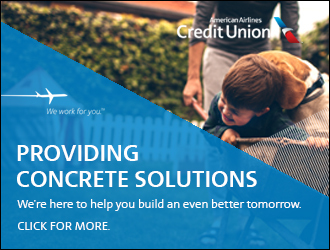 The airline is also putting a heavy emphasis on communication, keeping customers accurately informed on their flight’s status from boarding to departure so they can better anticipate their arrival at the destination. With more visibility to the de-ice operation, crews can work through checklists and tower correspondence more proactively all while continuously communicating the aircraft’s position in the de-icing process and informing travelers of the importance of de-icing. This level of transparent communication will offer customers peace of mind by helping them understand Delta’s standard of safety and how it directly relates to their flight. To aid customers travelling during inclement weather the airline will also be expanding the Delta Peach Corps, a volunteer team of office employees previously deployed only in Atlanta but now available in various hubs to help customers with check-in, wayfinding and other high-touch needs.